At the end of last year, I made a list of goals I wanted to achieve in 2018. One of those goals was to prepare a manuscript for admission into Pitch Wars. Though at the start it seemed like a daunting task, I am happy to tick it off as a goal accomplished. I’ve even started sending my manuscript out to agents. But in the process of lengthening and revising my manuscript, I discovered the importance of having a writing process. Deciphering my process led me through six rounds of drafts/revisions between January and September, with two of them being significant rewrites. Utilizing all I’ve learned over the first half of the year, I’m heading into my new project with a better sense of what I’m doing. Note I said “better.” It’s not perfect, and my process will evolve as I learn more, but at least I have a plan to make the process more efficient. So with my manuscript out in the query trenches, it's time to get started on a new project. A fellow writer I follow on Instagram introduced me to the virtues of Trello. I’m incorporating it into my process instead of using my whiteboard so I can access it while on the go. The horizontal timeline look of the boards makes a good layout for plotting the beats of my story and let me see what I’m working with. You can include pictures, notes, and labels into each card. The free plan allows you to customize the background with solid color options and pre-loaded stock images. For personalized backgrounds, you’d have to get a paid plan. Trello muse: Jaq Abergas. She is an amazing human being and you should follow her on Instagram. Setting up a board to plot your beats is simple. Step #1: Ensure you have your beats handy with a description of what each entails. Step #2: Plug in your beats and an abbreviated description of each into the title section of your board. These are handy reminders. Step #3: Click “Add Card” below each board heading to open a section where you can add in your scenes. Go through the notes you created and plug in the corresponding scenes. 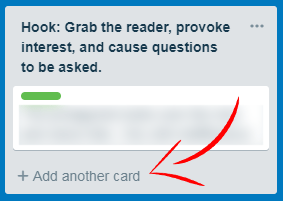 Trello gives you the ability to drag and shuffle cards in the same list as well as across the board. Step #4: At the end of your initial setup, you’ll see the beats that need filling if you haven’t covered all your basis. Brainstorm events you can include and if you get stuck, grab a friend. This is one of the reasons why having a writing circle is so important. I've made some of my best breakthroughs just bouncing ideas off my CPs (critique partners). Here's a list of resources you can check out to conk a few ideas loose. Take your time with this step bearing in mind the connection between your beat scenes. Even though you haven’t added in your connecting scenes, your beats should have a smooth flow on their own. Once you've completed this step (and yeah, things will change as you become more familiar with your story) you're ready to move on to Stage 4.C. with your Macro Outline. Writer tip: Knowing more about your characters can unlock ideas for your beats. Remember, these are critical moments that affect your cast in fundamental ways. So consider what scenarios would impact them the most and to do so you have to establish what’s important to them, their goals and motivations. There is no single way to plot and no one way to write. Experiment, see what methods work best for you. After you've formulated the premise of your story and outlined your beats, you can tackle Stage #4.B. At this stage, you'll combine the two into a draft synopsis. Yeah, synopses aren't fun. They drain your soul. But you best get into the practice of doing them, especially if you plan on going the traditional route for publication. Even if an agent doesn't ask for a synopsis upfront chances are high the editors and publishing houses they pitch to will require one. Whereas there are stipulated lengths and criteria for the synopsis you'd send to an agent/editor/publication house, this draft synopsis is just you fleshing out a rough preview of your story and can be any length. You should include all of your major beats. The connecting scenes should all serve a purpose to transition from one beat to the next. In these scenes you'll be equipping your characters with the knowledge, skills, and aid they'd need to tackle whatever comes at them at each major point. Bearing this in mind will give you ideas about what scenes to include. Whether they fail or not at your beat points, a lesson should be learned. They should unlock something that will help them in the next beat. Connecting scenes build up to each beat, foreshadowing what's to come but I usually leave the foreshadowing until later revisions when I have a better grasp on the story. In your first draft, don't get bogged down by overthinking your scenes and if they fit or if they flow or if readers will like them yadda yadda yadda. Just write. Think of your first draft as an elaborate expansion of your synopsis. The magic comes in the rewrites. I do hope this post was informative. If you have any questions about my beat plotting in Trello or any other step in my writing process, pop into my inbox, or leave a comment below. You can also link with me on Instagram. Until next time ... Happy plotting! Happy writing! Sign up to my monthly newsletter for access to the Owl Lounge where you can find free templates, guides, and checklists.